AUG 1967 - NOV 1967 Mediterranean,During 6 Day War,submerged,snorkeling most time. Quillback (SS-424) was laid down by the Portsmouth Navy Yard, Portsmouth, N.H., 27 June 1944; launched I October 1944; sponsored by Mrs. J. A. Tyree, Jr.; and commissioned 29 December 1944, Lt. Comdr. R. P. Nicholson in command. After training at New London and work on an experimental ordnance project at Key West, Quillback departed for Pearl Harbor and her maiden war patrol, off the coast of Kyushu. During this patrol (30 May-24 July 1945) she destroyed a Japanese suicide motorboat and rescued one aviator from the water only a half mile from the heavily armed shore. Surrender of the enemy found Quillback refitting for her second patrol at Guam. 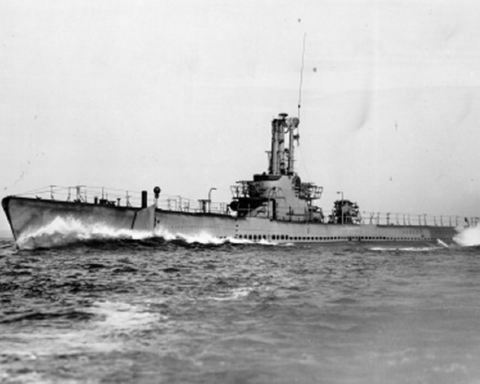 Peacetime duties returned Quillback to New London for duty as a unit of Submarine Squadron 2. From 1945 to 1951, she operated with the Submarine School in a training capacity and as an experimental unit of the Naval Underwater Sound Laboratory. In April 1951, Quillback departed New London for a six months tour of duty with the 6th Fleet in Mediterranean waters. In April 1952, she reported to the Portsmouth Naval Shipyard for decommissioning and conversion. On 27 February 1953, Quillback was recommissioned and joined the Submarine Force, Atlantic Fleet as a streamlined Guppy (Greater Underwater Propulsion Power) Submarine. She reported to ComSubRon 4 at Key West, Fla. There in local operations, with occasional trips to Guantanamo Bay, she assisted the Fleet Training Group in Destroyer ASW indoctrination. In 1956, 1957, and 1958 Quillback took part in major fleet and NATO exercises in the North Atlantic. In 1959 Quillback was transferred to Submarine Squadron 12. During 1960 she underwent extensive overhaul at Charleston to improve her offensive capabilities. She deployed to the Mediterranean in October 1961, returning to Key West in February 1962. Operating locally out of Key West from May to October, Quillback was deployed to Guantanamo Bay when the Cuban Quarantine was put into effect and remained there during the first 10 days of the crisis. During 1963 Quillback operated out of Key West and rendered services to the Fleet Training Group at Guantanamo. Quillback deployed to the Mediterranean for six months in July 1964. Experimental torpedo research and development projects were assigned to Quillback in 1965 until she deployed to Guantanamo Bay in June. She continued to operate out of Key West until deploying to the Mediterranean again from August to November 1667. She spent most of 1968 and 1969 in the Caribbean. She remains with the Atlantic Fleet into 1970. Quillback earned one battle star for World War II service.